Cars are not inherently evil to the Amish. They reject car ownership because they feel easy access to cars can weaken communal ties. The horse-and-buggy also has powerful traditional symbolism for the Amish, so much so that acceptance of the buggy is a litmus test for a church’s “Amishness.” Most Amish still travel in cars on a limited basis, riding with English friends and neighbors, or hiring an “Amish taxi” for longer trips. Buggy cost varies depending on the community, style of buggy, and whether it is new or used. The cheapest used buggies may be had for $1500 or less. A new buggy “fully loaded” (Amish buggy buyers also have options such as lighting, brakes, and other features) in the Lancaster County settlement can cost even in the $10,000 range. View a $9,861 buggy here. Where do Amish buggies come from? 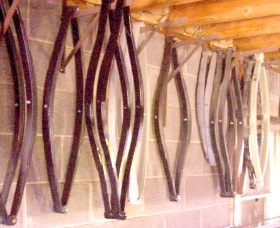 Buggy springs hang in a central PA carriage-maker’s shop. 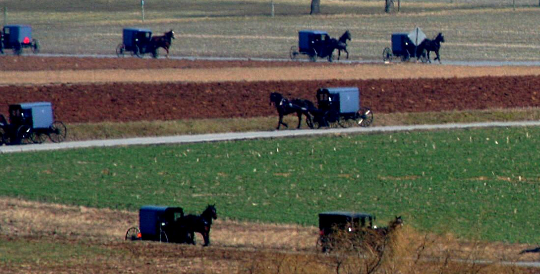 Most larger Amish communities have at least one buggy-maker within the settlement. Smaller communities will order their carriages from makers in other settlements. Buggies are assembled at a buggy shop, though the individual parts, such as wheels, elliptical springs, or lighting implements may be produced by or acquired from other businesses. Buggy buyers can select from a variety of features, similar to the new car-buying process (as long as the features are church-sanctioned). Some Amish buy their buggies new, but quite a few buy and sell used buggies as well. View photos of an Amish buggy shop. Amish households will have multiple buggies. Most Amish boys get their own buggy at age 16 (the same is not true for girls, who usually don’t have their own buggies but ride with siblings or other family to youth events like singings or volleyball games). In addition to closed buggies, Amish may also own open buggies for use by youth or to be driven in favorable weather. Additionally, Amish with younger children may own pony carts which children drive within a limited range, as well as other horse-drawn carts. At what speed do Amish buggies travel? According to the Ohio Department of Transportation, Amish buggies travel at speeds of around five to eight miles per hour. This is important to keep in mind when traveling in Amish areas. A car will approach a buggy on the road surprisingly quickly. Fifteen to twenty miles is a reasonable range for an Amish buggy horse, before needing rest and refreshment. They are black. And gray. And depending where else you go in Amish America, they might be white, brown, or even yellow-topped. Amish buggy color is one of many identifying features distinguishing one Amish clan from another. Read more on the 5 main buggy colors. Do Amish buggies have heating? Yes, some do. One solution is a propane gas heater which is mounted in the center of the buggy “dash”. Some Amish buggies of plainer groups have open fronts or open tops, by church regulations, thus exposing riders to the elements. These riders use heavy blankets to keep warm. See photos and read more on Amish buggy heating. What safety features do buggies have? Most Amish buggies display a Slow Moving Vehicle triangle on the rear of the vehicle. Additionally, they use a variety of red, white, and orange-tinged reflectors, as well as reflective tape around the perimeter of the buggy. Most buggies use blinking turn signals, powered by an onboard battery, which also powers headlights. Some buggies will have additional illumination to attract attention while on the road. More traditional Amish will only use oil lamps on their vehicles (sometimes just a single lamp). Why don’t some Amish use the SMV safety triangle on their buggies? Though the vast majority of Amish do use the distinctive orange triangle, the plainest, most traditional communities abstain from carrying the Slow-Moving-Vehicle warning sign. They have different reasons for doing this. These include objections to the brightness of the color, the idea that it is a man-made symbol, and a reliance that God’s will should be trusted and not “second-guessed” by using the warning symbol. Zook, Lee J. “Slow-moving Vehicles.” The Amish and the State. Kraybill, Donald B., ed. Baltimore: Johns Hopkins University Press, 2003. “Amish Buggy Safety on Ohio’s State Roadway System: Analysis and Action Plan.” ODOT website. Ohio Department of Transportation, Sep. 2000. Web. Anderson, Cory. “Horse and Buggy Crash Study I: Common Crash Scenarios between a Motor Vehicle and the Amish / Old Order Mennonite Horse and Buggy.” Journal of Amish and Plain Anabaptist Studies 2.1 (April 2014): 79-99. Web. <http://hdl.handle.net/1811/59688>. Anderson, Cory. “Horse and Buggy Crash Study II: Overstretching the Slow-Moving Vehicle Emblem’s Abilities: Lessons from the Swartzentruber Amish.” Journal of Amish and Plain Anabaptist Studies 2.1 (April 2014): 100-115. Web. <http://hdl.handle.net/1811/59687>. Anderson, Cory. “Horse and Buggy Crash Study III: Low Illumination and the Sun’s Glare in Crashes between Motor Vehicles and Amish / Old Order Mennonite Horse and Buggies.” Journal of Amish and Plain Anabaptist Studies 2.1 (April 2014): 116-124. Web. <http://hdl.handle.net/1811/59686>. To Cite this Page: Wesner, Erik J. “Buggies.” Amish America. Erik Wesner, 24 Jan. 2015. Web. [Date Accessed]. <http://amishamerica.com/buggies/>. Image credits: Buggy procession- Ed C.
I know that some Amish use former Standardbreds who didn’t make it big on the track, buying them at auction. When these horses, and horses, mules, and oxen (do Amish use oxen?) are too old for farmwork, or for pulling buggies, and there is no reason such as illness or injury to euthanize them, are they retired? Are they simply turned out to pasture each day, and treated as pets? Or sold at auction, to end up in a Canadian or Mexican slaughterhouse? This mane a silly question, so Please, please bear with me. In today’s Society & always has been the same Identical Attitude. I’ve Notice, Extram & Polite Amish People In Society. I can have the longest chat with Amish People on the Amtrak & they’re reserve. Therefore, the Polite Attitude is to really show Respect. Amish People will Chat, then will excuse themselves, to Ck on their Wives. Amish People are proving their Polite. Thru, I don’t Obviously agree with their Custom, I will respect & obviously allowed to live according to the Strict Rules, to what I’ve read: Amish People have been Permited to use Modern Communication Technology for Business only. Now, to rap up my Polite. Like Society, always has & always will be. Are their Amish people, whom simply not get alone. go obey their Strict Behavioral Rules & go their different ways. Eric, are you following me? Because, Amish People will Obviously Appreciate Polite Manners. Thank you Eric for your Website & your kind response.